Google ended the Glass Explorer program last week, halting sales while simultaneously saying that the program itself is not dead – whether the last part is true or not remains to be seen. People have asked me what I think, and I tell them I’m not surprised. Glass suffered the same fate a lot of innovative new products suffer. They die, but their useful features (as well as the lessons learned) get reborn in the next generation of products. Wearables are here to stay, folks, and it remains the next big growth area of media gadgets. I was skeptical early about Glass’ staying power because of the social challenges as well as the clunky looking design, but it was a beta product and was naturally going to have some rough spots. The social challenge will be smoothed out, in part by time and in part because of refined design that make wearable gadgets blend more into the background. Robert Hernandez at USC likes to make this point about cell phones. Remember this guy? 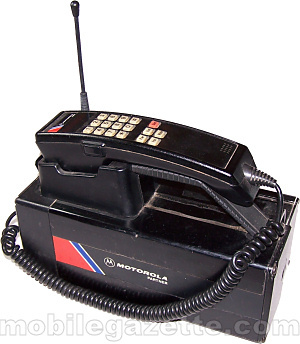 Check out this complicated car cell phone from the 1980s and tell me what exactly about that device is mobile. The devices got smaller and more unobtrusive over time, and even the social stigma about having a mobile phone (“stupid yuppies!”) faded to the point now where people have no shame taking them out in public places and ignoring others. The social challenges and clunky designs gave way to something more refined, and acceptance was born. So what do we need to do in order to improve on Glass 1.0? 1. One thing we’ve learned about tech as it has spread is that designers often are forgetting the “wear” part of wearables. The fashion matters. When I think of the clunky look of the first iterations of Glass, it reminds me of a quote from U2 lead singer Bono on the Bee Gees and why music history has not recognized the genius of the group’s catalog. The fashion matters! Apple is trying to get the fashion part right with the Apple Watch, to their credit. I also like the simplicity of the Pebble Watch’s design. But the intersection of products that are fashion conscious and usable is more sparse than it should be. Glass’ track pad, while useful, was just awful to look at. The black version attached to the designer frames looked a bit better, but it really stuck out for the most part. I don’t think the colors helped either. Tangerine and sky blue were bright and useful for smartphones, but on Glass it made people stick out and look strange. There wasn’t wonder attached to the device, only suspicion that people who wore it were weird. It felt weird and self-conscious to wear the device at times. That has to change. Google made some strides with this by partnering with designer frame makers, but by then the public perception was baked in. Solutions? Embed Glass’ display in actual lenses rather than that giant block of Glass, Trim down the trackpad or figure out a way to eliminate it. Things like that. 2. The battery was awful; it was the thing I complained about most in presentations. If we’re supposed to wear this all day, it can’t go dead in less than a day, which often was the case when making heavy use of the map or camera functions. The miniaturization of the tech just wasn’t there yet. 3. Price. Oh my god, the price. Even after the Explorer program was open to all, Google was asking $1500 to be a beta tester. My assumption had been that a public release would come with a big price cut. It never happened. You can buy several smartphones for that. Glass never felt like a device I’d pay more than $500 for, even if my use was as a media professional. I loved the ability to shoot hands free, but my smartphone camera is good enough if Glass costs twice as much. 4. Then there are the Glassholes. Though some were apocryphal, stories rocketed through media about people behaving badly with Glass in public, or getting attacked. Some of this was due to people being dumb (wearing Glass in a men’s room, for example) but some of it was design. Onlookers never knew when the camera was in use. In the ’90s, video cameras had a red light to let you know it was recording. Glass had nothing like it. It only generated suspicion that became baked in and self-reinforcing over time. 3. Maps and digital assistant were very helpful. I also liked how it was unobtrusive to the point where you had to consciously look up to see it. Easy access to maps and texts, this is a much better experience on a heads-up display than on the wrist. This was a killer feature, probably my favorite one that had nothing to do with journalistic use. What about Glass and the future of journalism? I’ve written extensively about how we experimented with the camera in my multimedia classes. I still believe first-person storytelling, whether it be via a wearable or a mounted GoPro, offers exciting possibilities for us and we shouldn’t abandon playing in that realm even if Glass really is done. We didn’t play much on the app development or augmented reality side of things, but others did. AR in particular is going to increasingly become a part of journalistic storytelling and, with or without Glass, we need to keep pushing the boundaries on it. We will keep using it in my multimedia classes. I’m not abandoning first-person stories, and it sends the wrong message if we’re encouraging students to only play with tech that we know has staying power. Journalism students need to play, period. They need to learn how to experiment with new gadgets, assess device strengths and weaknesses, learn how to bend it to their will to tell stories in new ways, and how to decide if adopting it is worth the effort and money. These are thinking and experimentation processes, and we rob our student by making our pedagogy only about established devices because in that mode we are always playing catchup. I want to produce students that are always trying to stay ahead of the wave. So we’ll keep playing with Glass. We’ll keep playing with lots of things as they emerge. I’m going to get a drone eventually. We’ll keep playing because that’s just what we do. It’s been almost two years but it’s totally been worth it. The Glass projects my class has been producing have been some of the most unconventional, weird, wonderful attempts at learning storytelling I’ve tried in a class. It made me a better teacher by having to learn the tech and brainstorm ideas with them. This is useful no matter whether Glass returns in evolved form or not. ← Coppee Hall “Maker Hours” start Sept. 19, 2-4 p.m.